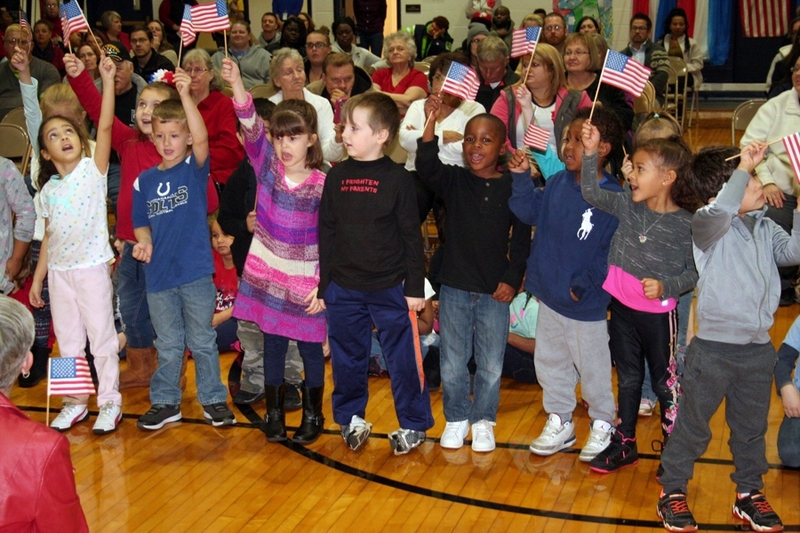 Kokomo School Corporation students recently celebrated the men and women who have served, and made sacrifices for, our country by participating in special Veterans Day programs that featured songs, dancing, poetry, special speakers, donations to veterans organizations, and more. Keynote speakers at the Kokomo Schools Veterans Day programs included veterans advocate Teri Rose and U.S. Army veteran – and broadcaster – Allan James, who enlisted in 1983. Local artist and businessman, Sean Verlee, composed and sang an original song, “Eagle Flying High,” at one of the programs. Students at one of Kokomo Schools’ International Baccalaureate (IB) elementary schools focused on the IB Attitudes to help build character by showing how service men and women exemplify these traits. At one Veterans Day program, students surprised representatives from Jackson Street Commons with a donation of food for the veterans home. Students at many Kokomo Schools buildings invited local veterans to be their guests of honor during the Veterans Day programs. These service men and women were honored with special roll calls and, in some cases, processions through the buildings. During one program, veterans were invited for a silent walk through the Memorial Room at the historic Memorial Gymnasium. Below is a brief history behind why the building was named Memorial Gymnasium. This history was compiled by Kokomo Schools Education Foundation Director Joe Dunbar. Kokomo’s Memorial Gym was dedicated on May 28, 1950, as a replacement for the 1925 Haworth Gymnasium, which was destroyed by a fire in 1944. The structure is intended to be an enduring tribute to those men and women from Howard County who served their country during World War II… many of whom lost their lives. Inside Memorial Gym is a special room, which symbolizes this memorial tribute. Kokomo residents Earl and Ellen Turner – and their daughter, Helen – contributed $50,000 for the room to pay tribute to all Howard County military personnel who gave their lives during World War II. The Turners’ son, John C. “Jack” Turner, was among those who were killed during that war. Jack was a 1942 graduate of Kokomo High School, and an Indiana All-Star on the Kokomo Wildkats basketball team. Jack’s portrait is on display in the room. On the west side of the Memorial Room is a series of three stained glass windows depicting all the major battles of World War II. On another wall is a large bronze tablet, which lists the names of the 211 Howard County residents who gave their lives during World War II.